Wow. This is cool. This is a DKW F12 Roadster. Take a look at the grille. It wears the Audi rings, but this is technically not an Audi. 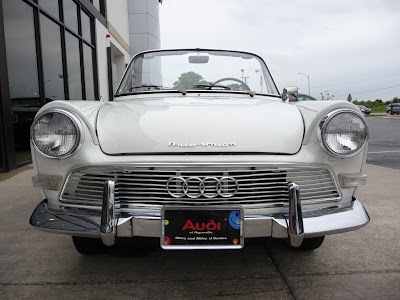 Auto Union / DKW and the Audi name were owned by Daimler Benz until 1965 when Volkswagen purchased the group. The F12 series of cars were the last DKWs produced. All had a 3 cylinder / two stroke engine in them. 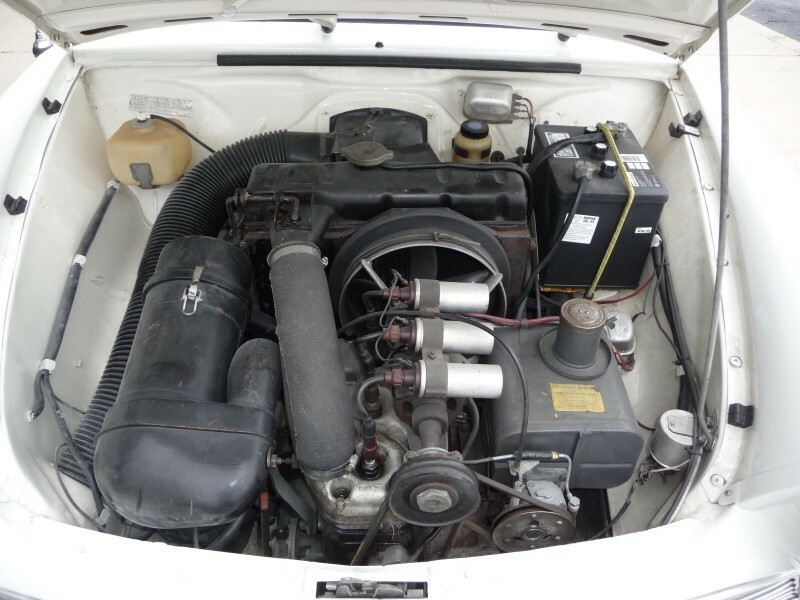 Volkswagen, realizing two-stroke engines were no longer in demand, started building a new DKW designed sedan, but with four a cylinder / four stroke engine instead of DKW's two-stroke engine. Fearing that the Auto Union / DKW brand was too well known for two stroke engines, VW decided to resurrect the Audi brand. It was the first Audi badged car since World War II. The 4 "rings", which symbolised the amalgamation in 1932 of four previously independent motor-vehicle manufacturers; Audi, DKW, Horch and Wanderer, were used on the new Audi and have been synonymous with the brand ever since. 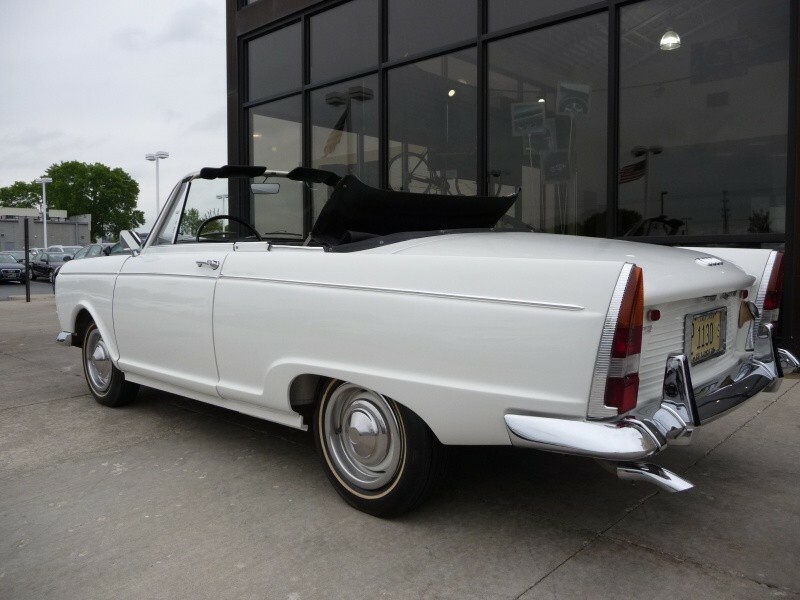 The DKW F12 roadster was only available for two years, 1964 and 1965. A total of 2730 were built. It came with an 889 cc three cylinder, two-stroke engine and a 4 speed transmission. 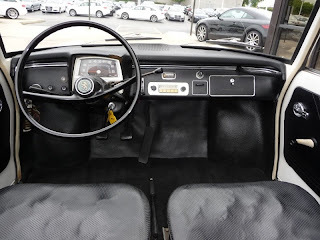 The shifter was mounted on the steering column. DKW liked to take styling cues from US cars and this one is no different. The tail fins and the cut down rear wheel arch could have come from any number of 1950s US cars. The front end is unique with the "arches" (for lack of a better word) surrounding the headlights and the big chrome grille. This car is in nice condition. It has a few flaws; a small dent in the right rear quarter panel and a rip in the drivers seat. Neither should be too tough to fix. This would be a great car for an Audi fan who wants to own a rare piece of Audi / Auto Union / DKW history. Being offered by an Audi dealer in Naperville, IL, click here to see the eBay listing (which has over 50 pictures of the car). This car is in great shape and has a lot less of the "shrunken T-Bird" look than others I have come across. I ended up looking up a bunch of DKW models on Youtube. It's worth a visit just to hear the sound of the engine alone. I've always wondered if these DKWs had that blue tinged exhaust associated with two stroke motors, or if brake wear was ever an issue. That Argentinian classic car link I posted many entries ago has a ton of DKWs. So "cut and paste" the link below into your browser... it will bring you right to the DKW's. The numbers below the photos will bring you to additional sets of cars. If you can't read the language in the Argentinian entries, use the Google Translate link below. Here is how you do it... Paste this into your browser. Just stick any car link (URL) into the box provided and click "Translate." Sometime it can "auto detect" the language, and other times you have to change the "Translate from and Translate into" parameters. Also, at times it only works for the first page, and you have to start all over and repaste the URL of the second page (and so on...) into the box for translations of subsequent pages. Other sites will have everything translated. I'm a bit of an internet moron so forgive me if this is something you folks are already familiar with.